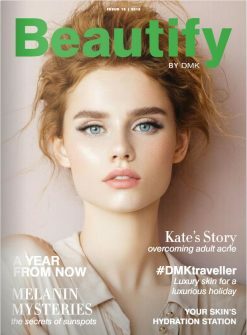 DMK is more than a skincare range, it’s a philosophy of ‘remove, rebuild, protect, maintain’ and DMK Enzyme Therapy is at the core of this philosophy. It’s a tool that allows your therapist to uniquely address your skin concerns through utilising messenger enzymes to mimic the body’s own chemistry. We have several options for Skin Consultations and Skin Analysis. Option 1. Just wanting a quick catch up? Need advice on how to expand your home care? Then this FREE 15 minute Skin Review with a DMK Therapist is perfect!. This review assists with making the best choice of skin care for home use addressing your skin health and maintenance. We do recommend scheduling a time with your therapist to get the full benefit of the free appointment. But if you are just popping in, please feel free to ask if a therapist is available for a catch up. We are happy to assist in any way. Option 2. An OBSERV Skin Analysis and DMK Consultation is $100. A 1 hour Skin, Health and Well-being Assessment that will expose your ‘true’ skin through diagnostic imaging. This Consultation is a prerequisite for all clients transitioning into DMK Skin Revision Programs OR for clients who wish to track the health of their skin, especially clients with ongoing skin conditions and a history of melanoma. It is the therapist’s responsibility to educate the client and ensure you have a good understanding of YOUR skin. We will support you with the knowledge and skills to achieve results. Respect that your therapist is obligated to advise you on any skin dis-function causing skin concerns. * A 12 month review is highly recommended for clients with genetic risk and a history of skin cancer. * If at any time your therapist identifies anything out of the ordinary, we are obligate to make a referral to a skin specialist, mole map or physician to seek further advice and/or treatment. Option 3. The DMK Intro Enzyme and FREE OBSERV is the perfect treatment for any ‘new client’ transitioning into Professional DMK Salon Treatments. Our priority is to test your ‘Skin Health’ and the Barrier Repair Function. Is your skin strong or is it impaired and compromised due to environment, genetics, cell function, lack of nutritional support, medication or hormones? Before introducing the most powerful ingredients available in any professional skin care, we listen to your skin! The DMK Intro Enzyme and FREE OBSERV Skin Analysis is $190. This is the Rolls-Royse of S.K.I.N Consultations! This Skin Assessment includes a complete Introduction to DMK Enzyme Therapy and Protocols. It includes a FREE OBSERV Skin Analysis valued at $100 and your therapist will design and present several options including professional programs and prescribe home care products to achieve your S.K.I.N Goals! “THE PURPOSE? We are ‘TESTING YOUR SKIN”. Step 3. Followed by a full DMK Assessment reviewing current skin condition, health and well-being. Step 4. Your therapist will then perform a select DMK Enzyme Therapy Treatment including the application of the DMK Enzyme Mask that remains on the skin for 30 minutes – be prepared, the mask is tight! Step 5. Your therapist will also perform several test patches across the décolletage and shoulders, recording any findings. Step 6. The therapist will record any dis/functions and will structure a program specifically designed for you. Your commitment, your investment, your time, your goals, your desired results ….. all contribute to how fast you want to achieve your S.K.I.N Goals and maintain them for life. “WHY? … Why do we have to test the skin? lobster and creme brulee? Can your skin digest and process it as fast as you consume it? NO? How do you feel when you over indulge? ……. So, how do you think your skin will feels? REMEMBER; We have to condition your skin from a couch potato into a Gold Medalist Athlete! Why is my skin not acting like it was in my 20’s? and your genetics have all contributed and compromised your skin over the years. How can we prescribe and adjust your program so your skin can manage these changes (*digest the buffet) and ultimatly transform your skin. home care, achieving the best results, long term”! Our goal is to guide and educate you. Loosing 10 pounds is an amazing achievement, keeping it off is the ultimate! If you choose to invest in your skin health and how you look and feel everyday, then home care is the most valuable investment you can make. Don’t go back to eating cheese burgers and tim tams! We all know what the out come is, right”? You do not need to have Salon Treatments or advance skin consultations to be using DMK Home Care products. However, You do need to be using DMK Home Care Products when undergoing Any Skin Revision Program. * This is a prerequisite for advance skin revision. New clients are required to arrive 15 minutes before any DMK Treatment to allow time to complete the clinic consultation forms. * NOTE Time to complete consultation forms is not included in the allocated treatment time and may result in reduced treatment time. must complete a DMK INTRO ENZYME & FREE OBSERV Consultation first. THIS IS WHERE YOU START YOUR S.K.I.N JOURNEY! 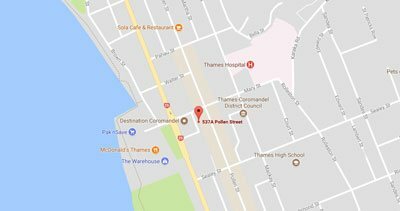 discuss your options during your consultation or feel free to book a review. This treatment introduces you to the DMK experience and your skin to DMK. An extensive appointment that consists of a OBSERV Skin Analysis and DMK Consultation to review lifestyle, skin condition and cell dysfunction. Your therapist will prescribe optimum skin care to support and help correct your skin concerns, then record and forecast the perfect S.K.I.N treatment program to achieve your skin goals. 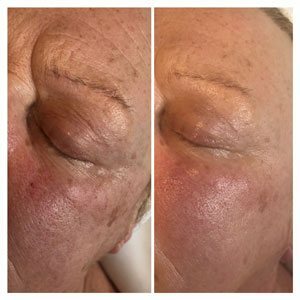 All new clients to Paramedical Skin Revision must have the DMK Intro Enzyme before transitioning into Enzyme Therapy and Advance Skin Revision programs. Our protocol and reason for this is to initially test the skin cell function and strength; is the skin performing as it should OR is the skin impaired and dysfunctional, resulting in undesirable skin conditions. Our Enzyme Therapy is perfect for S.K.I.N Maintenance. It consists of gentle enzymatic removal of dead cell build up focusing on Enzyme and Oxygen Therapy. Using transfer messenger enzymes, DMK restores skin to its peak condition to re-balance, tighten and firm. S.K.I.N maintenance treatments are recommended every 3-4 weeks to maintain optimum skin health and appearance. ADD a Dermal Needling treatment to your Enzyme Therapy; the perfect addition for the production of collagen and elastin, reduce fine lines and pigmentation. * There is no exfoliation with this Enzyme Therapy – we do not want to further compromise or strip a already impaired skin. * This is a great option for reactive, impaired skin, genetically sensitised and weak fragile skins that needs strength, with caution. Designed to effectively reduce dead cell build up that increases the signs of aging, dehydration and fine lines. This level skin revision treatment or treatment program combinations are to maintain glowing skin if treatments are performed every 3-4 weeks. If you desire R.E.S.U.L.T.S, these treatments are extremely effective if performed weekly and home care prescriptive are followed. Discuss S.K.I.N Revision Programs with your Therapist. FOR THE LOVE OF SKIN! IT IS TIME TO GLOW! Your therapist will discuss all the options with you during your S.K.I.N Consultation. Advance S.K.I.N Revision treatments are for DMK conditioned skins that have been prepared to move into Advance Therapies to address stubborn skin conditions that have developed over years; like deep congestion, glycation (deep criss-crossed wrinkles), Acne/Cystic and Acne Scaring and pigmentation. It is also an advance program designed for Serious Age Revision and Muscle Toning, the perfect program to reverse time. ACHIEVE RESULTS LIKE; 10 YEARS IN 10 DAYS! Just starting to show signs of ageing or want to correct sagging or loose skin? DMK’s MUSCLE BANDING Treatments will help you to retain and rebuild your skin structure, providing a healthy, glowing skin for many years to come. 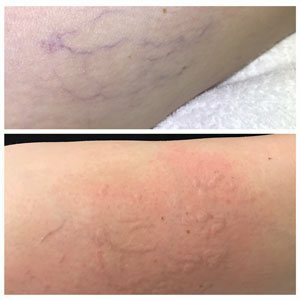 MUSCLE BANDING is a 8 or 12 week treatment program that involves weekly enzyme treatments (7-10 days apart). Enzymes work by physically stimulating & strengthening the muscles of the face and neck but without the physical effort. The more treatments, the better the results. Just like any physical exercise program, faster results are obtained from regular treatments because of muscle memory. DMK’s MUSCLE BANDING Treatment is an age management program designed to slow the process and loss of function that occurs with ageing. This treatment is suitable for both men and women who want a highly effective age management treatment that is Natural, Non Invasive and Pain Free. The treatment instantly lifts and firms the skin and helps to restore optimal skin functioning. Just like going to the gym, repeated treatments will get the optimal results. The muscles are retrained to create the lifting and firming. Hair removal, Acne Revision, Milia, Congestion, Aging and Skin Resurfacing, Pigmentation, Rosacea, Stretch Marks and Scar Revision. Discuss your S.K.I.N revision options with your therapist. 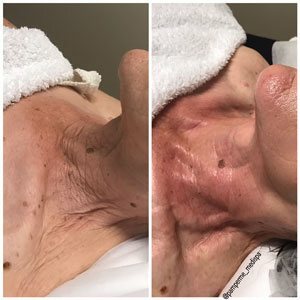 This is an intensive resurfacing treatment program that requires the client to be on DMK home care prescriptive and has undergone a minimum of 2 professional enzyme treatments within 4 weeks prior to the peel program. This program consists of 4 treatments over 10-14 days. This treatment plan consist of ‘down time’, we encourage returning to work from day 7-10 depending on individual comforts. This program is most suitable for minimizing the signs of pigmentation, aging, wrinkles and fine lines, thickened uneven skin and texture. The packages include key products to ready and care for your skin during the program. Including Retosin, EFA and Contraderm. Down time is involved. Suitable for pigmentation, ageing, wrinkles and fine-lines, thickened uneven skin texture. RP is similar to the Pro Alpha Six Layer Peel but with more dramatic results. We have the same protocol prerequisites that clients have a minimum of 2 DMK Eznyme Therapy treatments within 4 weeks prior to undergoing the RP program. This is also a 10-14 day package involving four treatments including two application days and two Enzyme lift off treatments. A resurfacing and remodelling procedure which aims to remove dead cell build up and instigate collagen development. Designed to improve the structural integrity of the skin and help revise skin back to a youthful healthy state. Not everyone wants to commit to cosmetic surgery when signs of ageing become apparent. The DMK Remodelling Procedure (RP) for Face or body is based on the DMK Philosophy; Remove, Rebuild, Protect and Maintain. A RP revises the architecture of the skin, addressing the underlying conditions with the aim to return skin to a strong, healthy and youthful condition, including; Photodamage, wrinkles, pigmentation, sagging and a textured surface that is rough and increasing. RP is working on the preservation of attractive skin for face and body. 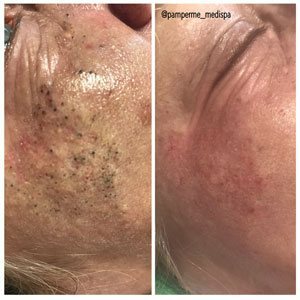 NOTE: Depending on the client’s skin condition and revision goals, a second RP protocol OR Pro Alpha 6-Layer Peel may be recommended within 12 months.